The aim of the study was to assess the quality of family planning counseling sessions and assess clients' satisfaction with family planning counseling sessions. Family planning (FP) is now acknowledged as one of the most successful development interventions, with potential benefits on maternal and child health outcomes, educational advances, and economic development. This was a cross-sectional study conducted in family health facilities in Sadat City District, Menoufia Governorate, including all FP services providers in the studied family health facilities using a checklist and self-reported questionnaire to assess the qualification of providers of FP counseling and the availability of services and resources. The study also included 200 clients who were randomly selected from attendants of the studied facilities for FP services to assess their satisfaction regarding the counseling session. There was a significant difference between physicians and nurses regarding performance of FP counseling sessions, where nurses showed better performance than physicians in all steps of the checklist. There was also a significant difference between physicians and nurses regarding duration of experience and previous FP counseling training courses. Total satisfaction score was better among clients in rural facilities. Balanced counseling strategy gave better scores for nurses than for physicians in providing counseling sessions for clients. To overcome the problem of overpopulation, the family planning (FP) program is aiming to help families to have a suitable number of children, help mothers to have pregnancies within the safest childbearing period, and postpone pregnancy for required period of time when indicated for medical and social purposes . FP helps women preserve their health and fertility and also contributes to improving the overall quality of their lives as; it allows them to control the number and spacing of their births . It has been documented that perinatal outcomes and child survival can be improved mainly by lengthening interpregnancy intervals . FP counseling is interaction between clients and providers who serve them. In the ideal client–provider interaction, the provider treats all clients respectfully, responds to their reproductive needs and intentions, helps in the selection of the most appropriate FP method, and offers sufficient information to use the method safely and effectively . Clients are more likely to be satisfied with services if all staff members, not only the counselor, treat them with respect and friendliness. Client satisfaction is associated with improved use-effectiveness and continuation . Use of audiovisual aids and contraceptive samples is important to help the client to better understand the chosen method. During the counseling session, use of posters, flipcharts, illustrated booklets, and sample contraceptives helps the client to remember key information and remind the provider to discuss important points . In the health communication, there has been an increased focus on the concept of shared decision making, which lies between the two poles of informed choice and directive counseling. Prioritizing patient autonomy in the choice of a Method is (informed choice) and the desire to encourage women to use highly eff ective methods is (directive counseling) . The decision-making process is seen as a process of bringing these two areas of expertise together, with the healthcare provider having superior knowledge of the medical information and the client being the expert regarding her own values and preferences . Ensuring that women have all the necessary information about the adverse effects can assist them both with method selection and method continuation, as intolerance of contraceptive adverse effects is a common reason for discontinuation of contraceptive methods. Providers must be prepared to respectfully address specific concerns that women may have about adverse effects and risks of contraceptive methods . Also, making follow-up visits may help patients switch between methods or using emergency contraception to protect them against pregnancy . Balanced counseling strategy (BCS) was developed to improve client–provider interaction in FP provision. The BCS is a practical, interactive, client-friendly counseling strategy that uses three key job aids (visual memory aids) for counseling clients about FP: an algorithm (decision tree), a set of counseling cards on different contraceptive methods, and corresponding brochures on each of the methods. BCS is divided into three counseling stages: prechoice, method choice, and postchoice stages . A cross-sectional study was conducted in family health facilities in Sadat City District. The study was conducted in the context of time frame of 12 months (starting from the 1 March 2015 till the end of March 2016) in all family health facilities (n = 15), in Sadat City District, Menoufia Governorate. A total of five facilities were in urban areas (one center and four units) and 10 were in rural areas (two centers and eight units). The study included all FP services providers in the studied family health facilities. The total number was 45 providers: 21 physicians and 24 nurses. Moreover, 200 clients were randomly selected from attendants to the studied family health units and centers. The Menoufia Faculty of Medicine Committee for Medical Research Ethics reviewed and formally approved the study before it was initiated. An official permission letter was obtained and directed to the administrators of the studied family health facilities. Communication was also made with the health unit directors to inform them about the objectives and procedures of the study to get their cooperation and facilitation throughout its practical aspect. A written consent was obtained from all participants after simple and clear explanation of the research object. A checklist of BCS stages according to United States Agency for International Development user's guide  was used for assessment of quality of FP counseling sessions through observing steps below. It included four steps: warm relationship, rule out pregnancy, set all of the counseling cards, and set aside nonsuitable cards after knowing reproductive goals, breast feeding, past problem with a method, partner support, and condom use. It included three steps: information about methods not set aside, asking client to choose method, and using brochure to exclude nonadvised condition. It included the following steps: inform client about chosen method, referral and backup method if needed, complete the counseling session, and invite return and thank for visiting. Moreover, a semistructured questionnaire was constructed to assess the qualification of providers in providing FP counseling and services and also to assess availability of resources. It included questions about duration of experience. Previous FP training courses, previous FP counseling training courses, availability of refreshing training courses, availability of job aids (cards, brochures, and algorism), availability of FP methods (intrauterine device/loop, pills, injections, male condom, and subdermal implant), availability of infrastructure (waiting area, area for examination, and clean latrines), availability of equipments (ultrasound, sphygmomanometer, stethoscope, equipments for loop insertion, autoclave, gloves, gowns, and goggles), and availability of infection prevention measures (running water, liquid soap, alcohol rub, disposable towels, educational posters, safety boxes, correct antiseptic techniques, and nontouch technique in loop insertion). Moreover, 200 clients were randomly selected from attendants at the studied family health units and centers for FP services during the period of data collection (10–20 clients from each family facility). They were subjected to a semistructured questionnaire to assess clients' satisfaction regarding the FP counseling sessions they received; it included questions about the effect of counseling sessions on choosing method, availability of FP provider, sufficient information taken about each method, availability of FP methods, availability of job aids (cards and brochures), and waiting time. Data collection and analysis were done and then extraction of incomplete data and tabulation on Excel program was performed. Data were tabulated and analyzed by statistical package for the social sciences, version 20 on IBM compatible computer (SPSS; Inc., Chicago, Illinois, USA). [Table 1] shows that there was a significant difference between physicians (n = 21) and nurses (n = 24) providing FP counseling regarding duration of experience (P = 0.002), receiving FP counseling training course, and availability of refreshing training courses (P < 0.001). 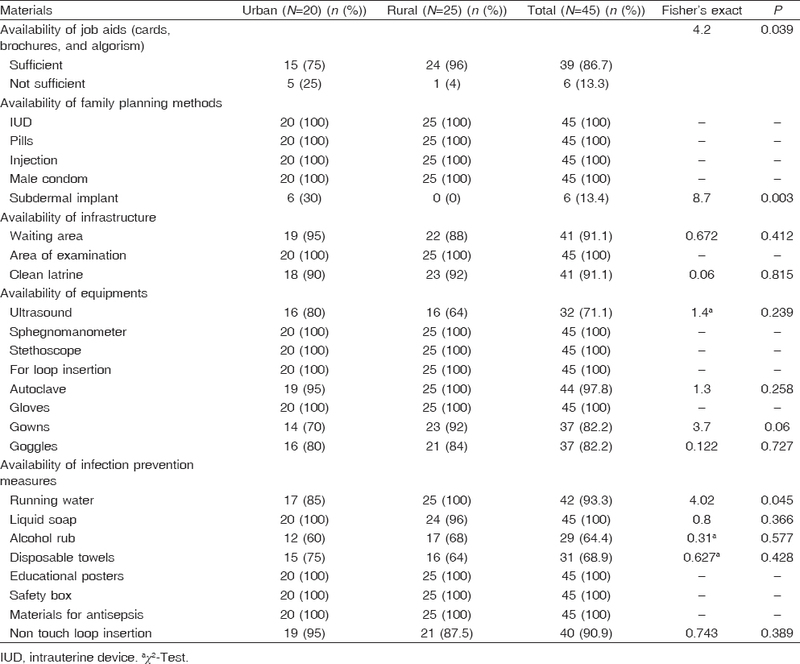 [Table 2] shows that there was no significant difference between urban and rural facilities regarding availability of nonhuman resources except for job aids (cards, brochures, and algorism) that were more available in rural facilities (P = 0.039); Implanon, which was available only in urban facilities (P = 0.003); and running water, which was 100% available in rural facilities (P = 0.045). [Table 3] shows that there was a significant difference between physicians and nurses regarding performance of FP counseling sessions, where nurses showed better performance than physicians in all steps of the checklist. 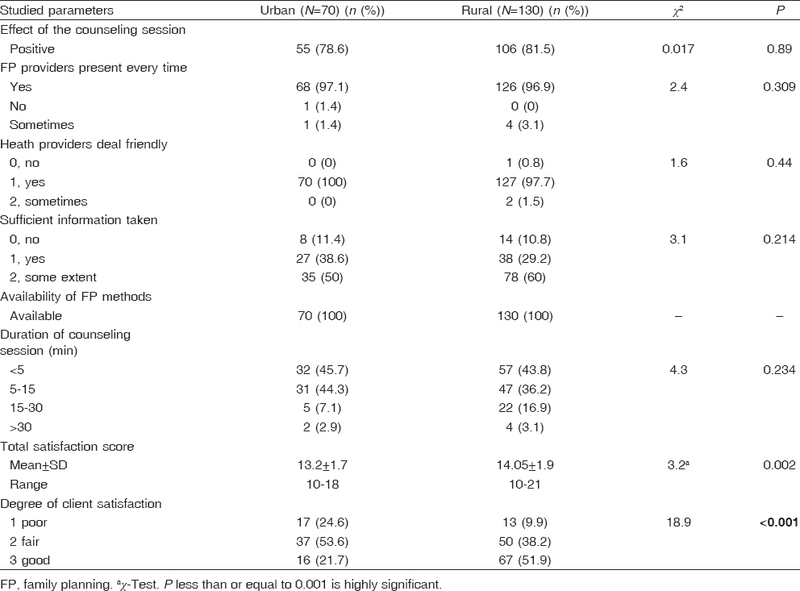 [Table 4] shows that there was no statistically significant difference between clients in urban and rural areas regarding satisfaction about FP counseling sessions; however, clients in rural area showed significantly higher satisfaction score (14.05 ± 1.9) than those in urban area (13.2 ± 1.7). Regarding the duration of physicians' experience in FP, this study revealed that 71.4% of physicians had experience of less than 5 years. However, Abdel-Tawab and Roter , who conducted a study in Egypt, found that 90% of physicians were in practice for ∼7 years. Regarding nurses' experience in FP, this study revealed that more than half of nurses (58.3%) had experience of more than 10 years. This is consistent with Mersal and Keshk  and Crigler et al. , who conducted their study in maternal and child health centers in Egypt and found that 55.2% of nurses had experience from 5 to 15 years. The present study found a significant difference between physicians and nurses regarding training courses about counseling, where100% of nurses versus 38.1% of physicians received counseling training courses. This was in disagreement with the study by Abd El-Hamid , who found that most of both physicians (72%) and nurses (93.3%) attended training courses about counseling. In the present study, only 26.7% of the studied providers (71.7% of nurses versus only 10% of physicians) used the counseling cards for all FP methods. This result did not match with those of Jain et al. , and Mersal and Keshk  who found that counseling sessions in which providers discussed and demonstrated more than one method were 83.1 and 82.3%, respectively. Also Crigler, 2006 , reported that in Nigeria, percentage of nurses explained all FP methods to the clients was only (36.9%). The present study found a significant difference between urban and rural facilities regarding availability of job aids (cards, brochures, posters, and algorism), where these were sufficient in 75% of urban facilities and 96% of rural facilities. On the contrary, Jain et al. , found that one-half (49%) of all sites visited did not have FP signs or posters about FP. The present study revealed that the duration of the FP counseling session was less than 5 min in 44.5%, 5–15 min in 39%, and more than 15 min in 16.5%. These results agreed with Fantahun , who in his study about quality of FP services in Northwest Ethiopia reported that the range of consultation time was 4–25 min. It ranged between 5 and 15 min in a study by Abd El-Hamid . Regarding satisfaction of clients about FP counseling sessions, the present study revealed that 85% of the clients were satisfied with the counseling sessions among the 200 clients interviewed. This result agreed with other studies, as a study by Abd El-Hamid , conducted on 120 clients reported that 90% of them were satisfied with the counseling sessions and a study by Jain et al. , in Tanzania found that nearly all clients (97%) were satisfied with the FP counseling they received. A study in Ecuador by Gordillo and Pinto  found that more than 80% of the clients were satisfied with the services they received. Moreover, Simbar , found that 83% of clients was satisfied with the counseling sessions. On the contrary, an Egyptian study by Abdel-Tawab and Roter 2002  found that the clients were less satisfied with FP counseling as only (65%) of the clients were satisfied with the services they received. Checklist based on BCS gave better scores for nurses than for physicians in providing counseling sessions for clients. This may be attributed to the longer duration of experience among nurses than physicians of the studied group, and also, attending FP counseling training courses was more prevalent among nurses than physicians. Total satisfaction score was better among clients in rural facilities. Train health providers (physicians and nurses) to manage contraceptive adverse effects. Messages on birth spacing and postpartum contraception should be integrated with antenatal care services. Raise awareness among husbands by seminars, which should be supported by channels of communication such as mass media. Ghobashy M, El Rabbat M, El Lawindi M. Public health and community medicine. Egypt population policy and family planning program. J Midwifery Womens Health 2011; 71:471–477. Brauner-Otto R, Axinn G, Ghimire J. The spread of health services and fertility transition. Demography 2007; 44:747–770. Cleland S, Bernstein A, Ezeh A, Faundes A, Glasier A, Innis J Family planning: the unfinished agenda. Lancet 2006; 368:1810–1827. Shelton J, Kumar J, Kim Y-M. FHI and the ACQUIRE Project. Interagency Meeting Organized by Family Health International; Managed by Engender Health; November 2005. Bongaarts J. Fertility transitions in the developing world: progress or stagnation? Stud Fam Plann 2008; 39:105–110. Abd El-Hamid EM, Abdel Menem NE, Fouad NS, Mahmoud HA. Assessment of the quality of family planning counseling sessions in family health units in Alexandria. [thesis]. Alexandria University; 2012. pp. 1–15. Dehlendorf C, Krajewski C, Borrero S. Contraceptive counseling: best practices to ensure quality communication and enable effective contraceptive use Clin Obstet Gynecol 2014; 57:659–673. Makoul G, Clayman ML. An integrative model of shared decision making in medical encounters. Patient Educ Couns 2006; 60:301–312. Kaunitz AM, Grimes DA. Removing the black box warning for depot medroxyprogesterone acetate. Contraception 2011; 84:212–213. Rodriguez MI, Curtis KM, Gaffield ML, Jackson E, Kapp N. Advance supply of emergency contraception: a systematic review. Contraception 2013; 87:590–601. Leon F, Vernon R, Martin A, Bruce L. TheBalanced Counseling Strategy a toolkit for family planning service providers. BCS-Users Guide, Population Council; 2008, pp. 4–5. Available from: http://www.popcouncil.org/research/ the-balanced-counseling-strategy-a-toolkit-for-family-planning-service at 12 May 2016. Abdel-Tawab N, Roter D. The relevance of client-centered communication to family planning settings in developing countries: lessons from the Egyptian experience. Soc Sci Med 2002; 54:1357–1368. Mersal FA, Keshk LI. Improving health education skills for nurses working in MCH centers in Egypt to enhance women awareness regarding family planning. Am J Sci 2012; 8:283–290. Crigler L, Alfredo L, de Diez FO, Gearon S, Gyuzalyan H. Factors that influence the performance of healthcare providers in Armenia, Bangladesh, Bolivia, and Nigeria. Perform Improvement Q 2006; 19:99–116. Jain A, Makawia A, Schlecht J Tanzania baseline survey report 2004–2005: technical report. E & R Study. New York: Engender Health/The ACQUIRE Project; 2006. pp. 10–84. Fantahun M. Quality of family planning services in northwest Ethiopia. Ethiop J Health Dev 2005; 19:195–202. Gordillo A, Pinto E. Ecuador family planning: quick investigation of quality. In: sullivan TM, Bertrand JT, editors. Monitoring quality of family planning services by the quick investigation of quality (QIQ): country reports. MEASURE Evaluation Technical Report Series No. 5. Ecuador, Carolina Population Center, University of North Carolina at Chapel Hill: Carolina Population Center, University of North Carolina at Chapel Hill; 2000. Simbar M, Ahmadi M, Ahmadi G, Reza H, Majd A. Quality assessment of family planning services in urban health centers of Shahid Beheshti Medical Science University, 2004. Int J Health Care Qual Assur 2006; 19:430–442.